Vendors of street food in Thailand are very good at publicly displaying and showcasing the ingredients and dishes they offer. Even if you don’t know Thai, if you can remember a few food clues, you’ll have a much better time finding and ordering street food in Thailand. 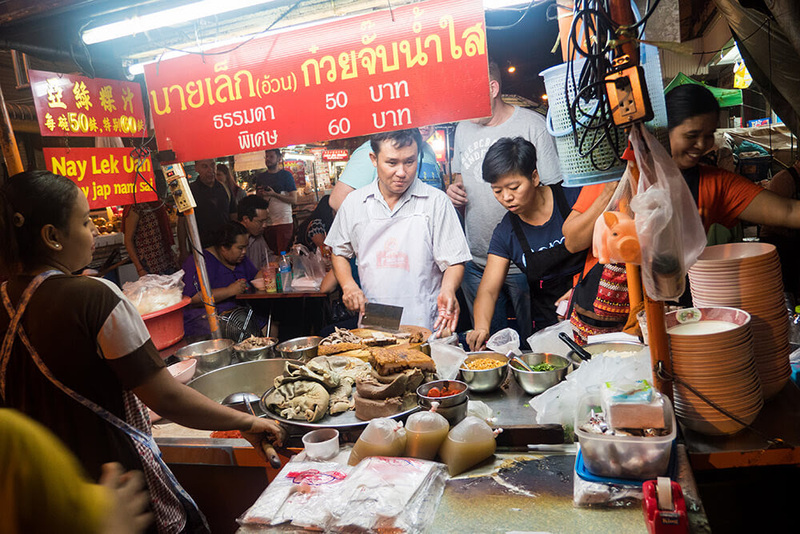 Mark Wiens shares some insider tips from his Eating Thai Food Guide, which will show you how to order from 5 of the most common types of street food carts you’ll find throughout Thailand. 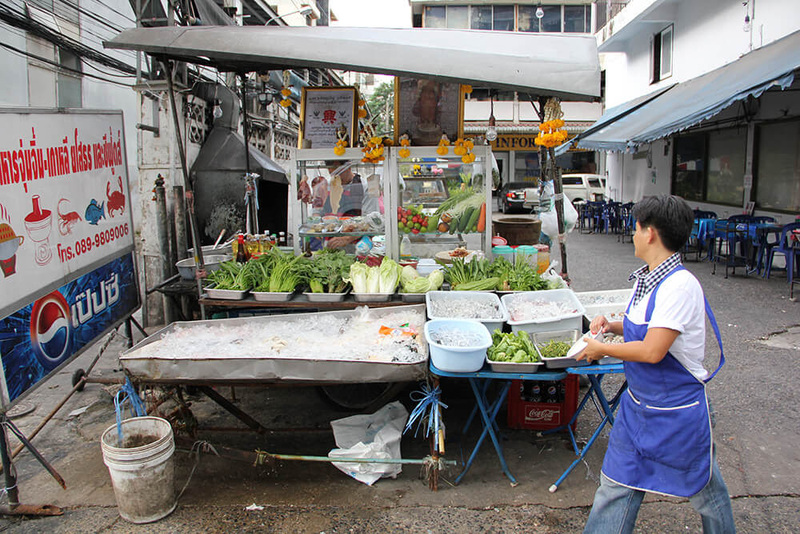 If you remember these main food carts, and the dishes they serve, you’ll have a serious advantage to ordering and eating the best Thai street food. Isaan is the northeastern region of Thailand, and it’s famous for food. 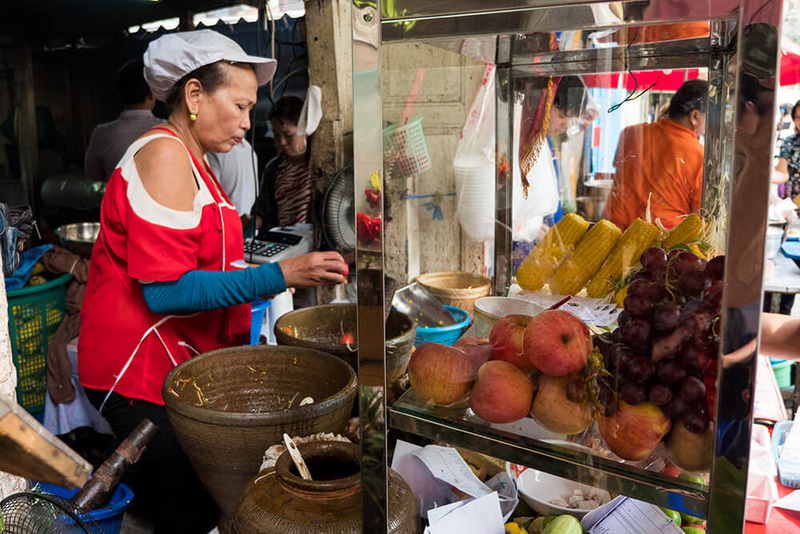 To locate an Isaan food cart, be on the look out for a cart that’s stashed with green papayas, cucumbers, tomatoes, and a big wooden or clay mortar and pestle (pictured above). Isaan food carts often also have some meat grilling on the side, like chicken or pork. Whenever you spot a street food cart where someone is cooking over a wok (a rounded metal skillet), you can be pretty certain you’ve found an ahaan dam sang restaurant. Along with a wok, you’ll also see a glass cabinet filled with all sorts of different vegetables, eggs, and meat, and maybe a pot or two of soup broth boiling on the side. You can either order rad khao (ราดข้าว), meaning on top of a single plate of rice, or gap khao (กับข้าว), where you’ll get the dish and rice on separate plates. Khao gaeng in Thai means rice and curry, and this is a type of restaurant or cart you’ll see all over Thailand, from the north to the south. If you’re interested in eating Thai curries, this is the best type of restaurant to find. To order, you normally get a plate of rice, and can then point and choose 2 – 3 different dishes of your choice, which will be scooped over the top of your rice. If you don’t know the names of the dishes, the best way to order khao gaeng is to just point to two or three dishes that look good. 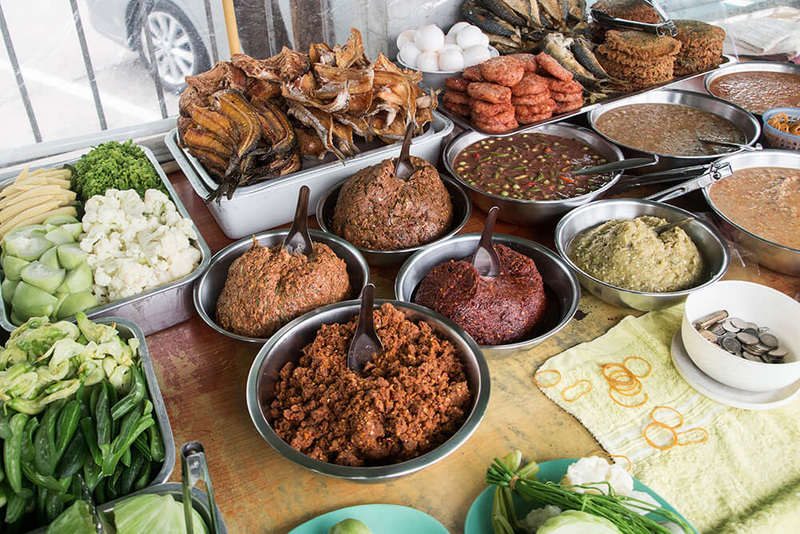 You’ll normally find nam prik food carts at local markets, showcasing a variety of different chili dipping sauces in metal bowls, alongside trays full of boiled vegetables, and often some fried or grilled fish. The best way to identify what one-dish carts are selling is to see what they have on display – could be egg noodles, or chicken, or duck. For instance, a food stall that has a couple of boiled chicken hanging in the glass cabinet is probably selling khao man gai (ข้าวมันไก่), or chicken and rice. Also, make sure you look at what customers are eating – do they all seem to be eating the same dish? If it looks good, just sit down, and if you don’t speak Thai, you can usually just hold up a finger with the amount of plates you want. Street Food in ThailandRestaurant to try in Bangkok: Kuay Jab Nay Lek (ก๋วยจั๊บนายเล็ก) – for awesome kuay jab, noodle roll soup. 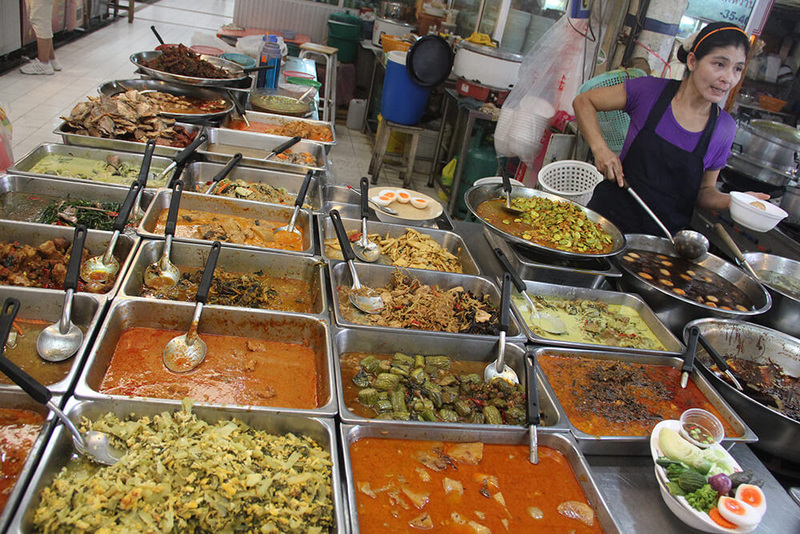 Read more at Mark Wiens blog: Eating Thai Food Guide. Enjoy! Great story about street food!